Newsletters - Regina Little Theatre Society, Inc.
Regina Little Theatre's newsletter, Masks and Faces, was first distributed just prior to the outbreak of World War II. After a short hiatus, it reappeared in 1943. 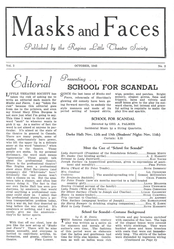 "We have always felt that the membership of Little Theatre needed something like this; some gossipy little rag which would serve to let you know what was going on in your own society; something to bind the whole membership into a solid front of drama-loving citizens" (Masks and Faces, January 1943, p. 1). Today, Masks and Faces carries on the tradition established in the 1940s. RLT's "gossipy little rag" is published up to four times a year and distributed electronically or by ground mail based on member preference. To view more benefits of becoming a member, click here. Check out recent editions of Regina Little Theatre's newsletter, Masks and Faces.